In the design/construction industry, there is a continued search for cladding materials that are reliable, durable, unique, practical, and also environmentally friendly. These requirements can make it difficult to also provide esthetic appeal. Natural stone, however, possesses all of these characteristics and more. Whether quarried or custom-fabricated, natural stone is a product that has withstood the test of time, and is known for its longevity and grandeur. It can easily be custom-fabricated, and is ‘green’ as well. Despite its age, the stone industry itself is progressive, operating within an environment of continuous improvement. Industry associations such as MIA+BSI: The Natural Stone Institute provide exceptional support. Altogether, natural stone is a safe, practical, and esthetically appealing selection, especially when compared with nouveau, fad-like building materials. During the concept and design phases of a project, natural stone can meet a variety of criteria. Unlike many manufactured cladding materials, which require large amounts of energy to produce, natural stone can be extracted from the earth, processed, slabbed, finished, and cut with great efficiency. As more emphasis is placed on green building programs like the Leadership in Energy and Environmental Design (LEED) rating system, or whole-building design and life cycle assessment (LCA), the concept of ‘embodied energy’ is becoming an important and relevant factor in gauging a material’s viability. Embodied energy is a measure of the carbon dioxide (CO2) emitted through total energy expended from the material’s extraction to the time it is installed on the building (also known as the time from ‘cradle to gate’). As building designs incorporate more materials—and, specifically, more carbon-intensive materials—to achieve lower energy use, an increasing proportion of carbon emissions from high-performance buildings is coming from those materials and products. By taking embodied energy into account, professionals can ensure they are designing for net carbon emission reductions. In the case of natural stone, this embodied energy could include the CO2 required during quarrying and transportation, as well as the energy required for slabbing and fabrication, site delivery, and installation. Natural stone is consistently rated as one of the building materials with the lowest embodied energy, according to a study conducted by SISTech in collaboration with Heriot-Watt University. (A report on this study, titled “Embodied Carbon in Natural Building Stone in Scotland,” was written by Naeeda Crishna, Dr. Suzy Goodsir, Professor Phil Banfill, and Dr. Keith Baker, and can be obtained by e-mailing info@sistech.co.uk.) It is highly durable, recyclable, low-maintenance, and emits no volatile organic compounds (VOCs). Various organizations in the stone industry have implemented standards and measures to ensure production sustainability, which is also driven throughout the supply chain. Given its widespread availability, comparatively low cost, and reduced environmental impact, stone is expected to play an increasing role in construction. 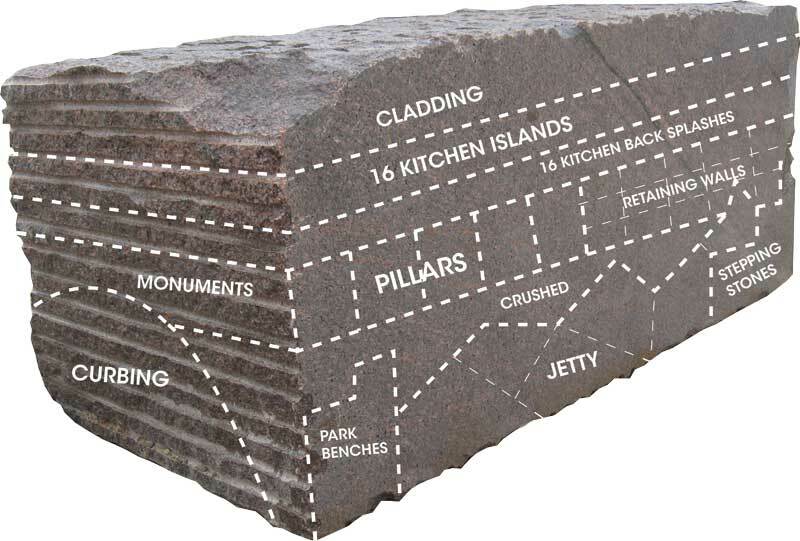 This diagram demonstrates the potential yield available from a quarried block and a plan to utilize all extracted material. Although beauty is in the eye of the beholder, it is difficult to deny the timelessness of natural stone. Its strength and its sustainability are showcased in buildings throughout the world. Additionally, with the sophisticated technology now available to quarries and fabricators—such as computer numerical control (CNC) machinery and robotics—natural stone can also be used for even the most intricate of architectural details. 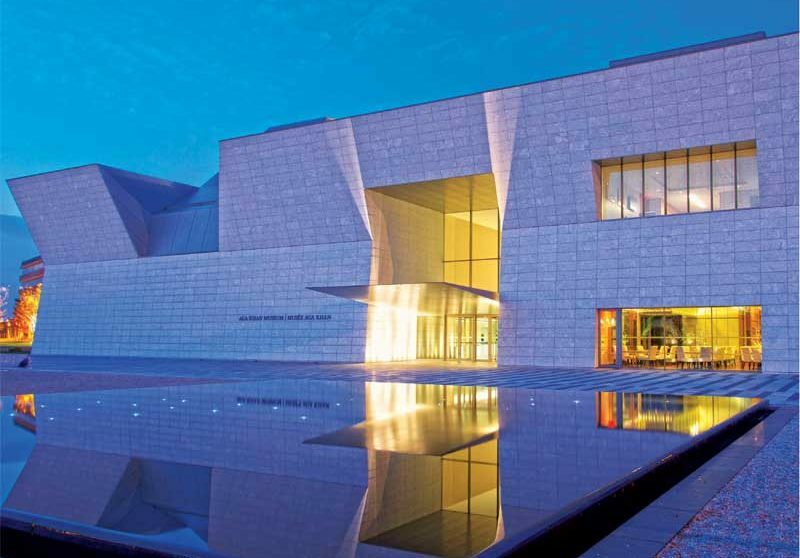 So, why are there not more stone projects in Canada? Money and time are two key factors in any purchase, and likely play a part here. However, natural stone is neither as costly nor as difficult to use as one might perceive. It has become something of an industry standard to engage specific consultants such as lighting and sound experts and structural, mechanical, and electrical engineers in the beginning phases of a project. However, specific stone consultants—not to be confused with general façade consultants—are rarely brought onto project teams from the outset. Stone can be an intimidating material to work with because of its variability. Too often, using stone is dismissed as an option because of a previous experience where problems were caused by the team unknowingly using incorrect stone for the application. Some professionals may have heard of cladding projects going awry because of ‘faulty stone.’ A stone consultant well-versed in façade systems can bring significant value to a project by ensuring the correct stone is used, the proper stone thickness is dictated, and the backup and anchor systems are precisely engineered. Similarly, a façade consultant possessing specific stone expertise will establish specifications to facilitate an apples-to-apples installation bidding process. Factors such as stone thickness and engineering will be settled upfront, eliminating any need for guesswork by the bidders. Moreover, shop drawings can be created by the stone consultant, with an eye on architectural vision and logistical efficiencies onsite. Stone consultants can help eliminate excess installation costs and logistical complications, and ensure appropriate material estimating data is used so as to avoid overages or underages. These aspects alone will reap a strong return on investment (ROI). The stone consultant’s role as a custodian of design who can ensure the correct stone for the design is obtained (i.e. stone with the appropriate sourcing, properties, thickness, and fabrication) also facilitates great savings on money and time. The earlier an expert stone consultant is engaged on a project, the more value can be achieved.